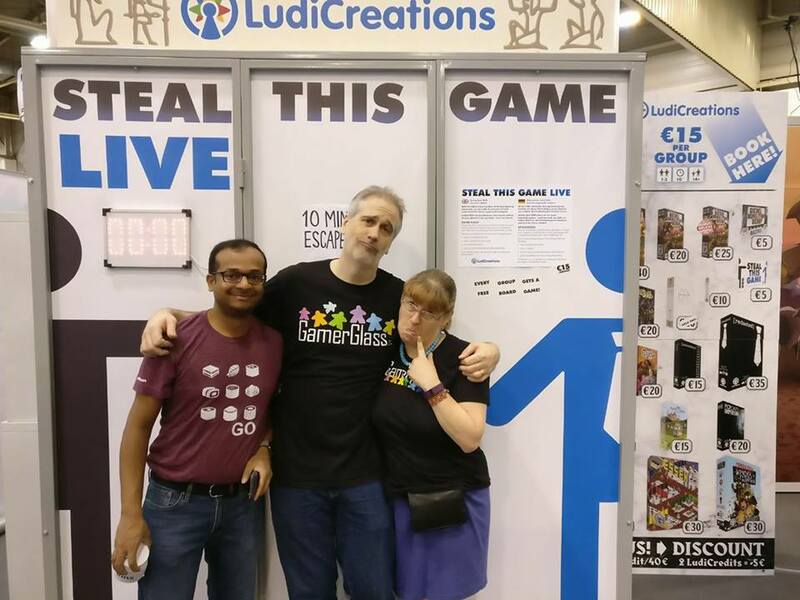 The survivors of Spiel ’17 report for duty! Looks like once more we made it through the Most Amazing Event of the Year a.k.a. the SPIEL fair in Essen, Germany, and are now going to tell you all about it! It was definitely full of busy times and sometimes stressful times, but we made it back alive and definitely managed to have loads of fun as well. And we did not get robbed this time either! Last evening, with well-deserved beers! 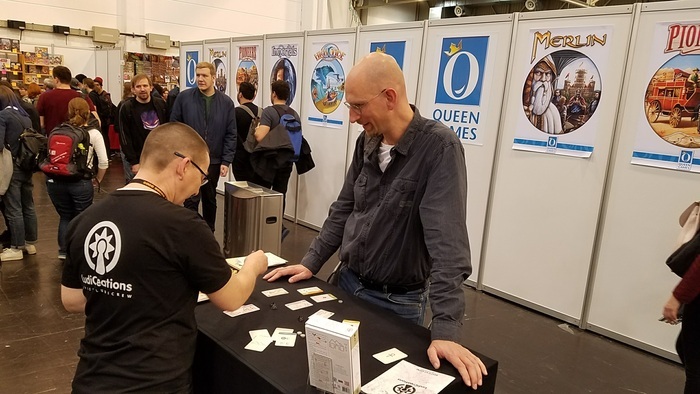 With the help of our awesome supporters, we presented five new games this year – Alexandria, Long Live the Queen Dieselpunk version, Long Live the Queen Classic version, Diesel Demolition Derby and IUNU – and had a lot of people visiting our booth and enjoying them. Thanks everyone for checking out our games (and bying them)! 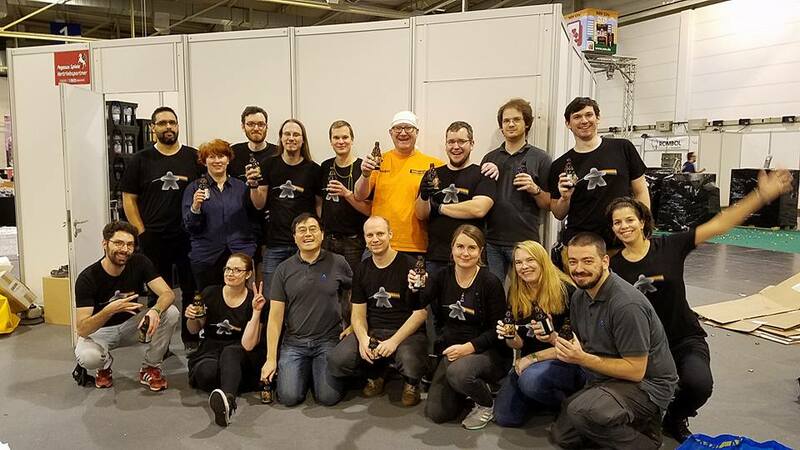 A big thank you to our supporters for tirelessly demoing our games! 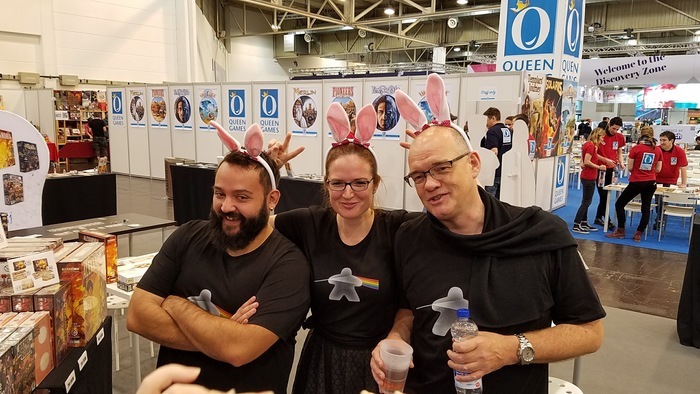 Bunny ears appeared on some heads already from a few years ago when we released Kune v. Lakia, by Babis Giannios (left, the designer of Alexandria), and never really went away. 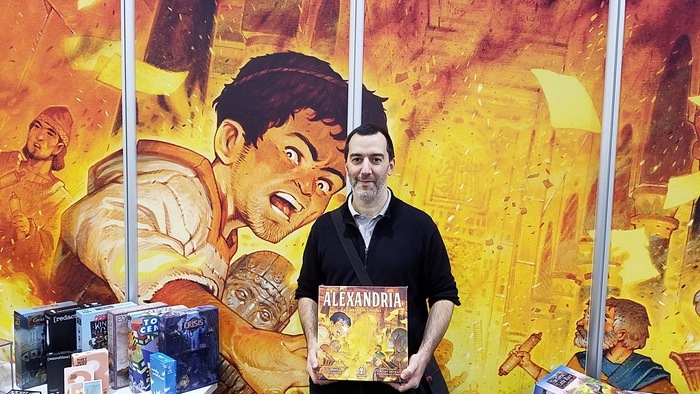 Vincent Dutrait, the creator of Alexandria’s amazing cover, visited our booth to see his creation for the first time! Our 6th new(-ish) game was Steal This Game which in turn was the inspiration for our 7th “game” at SPIEL, the Steal This Game LIVE escape room! During the four days of the fair hundreds of people put their wits to the test and helped us test our new “security system”, designed to prevent another robbery, like what actually happened during SPIEL’16. They only had 10 minutes to steal… Steal This Game, and many groups successfully defeated the system and got the game! With the support of our supporters, and fueled by copious amounts of Flora Power, we managed to put on a good show for everybody, including those who did not solve it in time. We also shot several unboxing videos of this year’s new games at the fair, you can check them out on our YouTube channel. 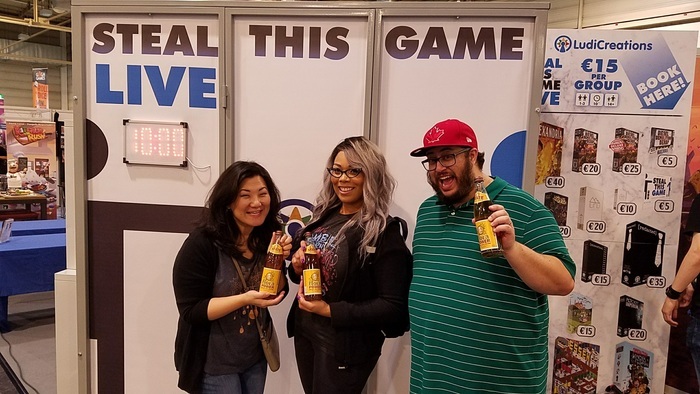 This special edition of LudiNews was just a glimpse of what went on at the LudiCreations Spiel booth. For more pictures, check our our Facebook page and/or Twitter feed. You can also start following us on Instagram!